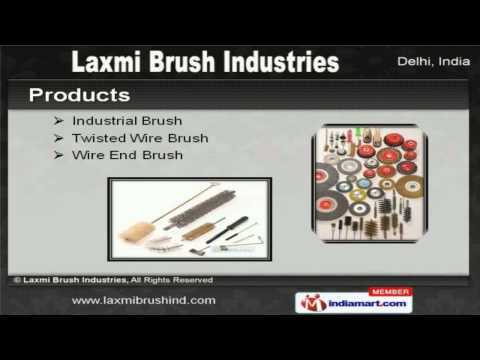 Welcome to Laxmi Brush Industries, Manufacturer and Supplier of Industrial and Commercial Brushes. The company was incepted in the year 2001. Extensive distribution network and State of the art infrastructure help us to achieve a present repute in the market. Reliance, LG Electronics and Bajaj Motors are some of our prestigious clients and we are backed by impeccable quality products and industry leading prices. We offer a wide variety of Industrial, Twisted Wire and Wire End Brushes. Our Circular Wire, Wire Cup and Cup Brushes are well known for their durability. We also provide Road, Welding Cleaning and Circular Nylon Brushes that are widely acclaimed in the market. We are one of the trusted names of the industry engaged in offering genuine quality Nylon End, Cup and Twisted Nylon Brushes. We are offering a top notch quality range of Abrasive Nylon Cup and End Brushes. We are known in the industry as the manufacturer of Wheel and Abrasive End Brushes.